I used to be terrified of hope. Well, I was actually terrified of disappointment. But I saw hope as a seductive and deceptive force that enticed me to climb higher, making the inevitable fall hurt that much more. I started writing novels when I was twelve years old, and have been searching for an agent since I was fifteen. After five years, a few “almosts” and a whole lot of rejections, I took a break from writing fiction and querying agents. Around six years later, my next novel smacked me upside the head and forced me to write it. (I really have no other way to put it.) And when it was done, and I finished revising it, I decided I was going to try this querying thing again. But this time I wouldn’t make the same mistakes I made as a teen. “No expectations,” I told myself firmly. When I was eighteen, for the first time, an agent had requested the full manuscript of my fourth novel. When he rejected it, the devastation knocked me flat. I was not going to let that happen to me again. So I started off on a whirlwind campaign of queries. I sent off dozens and dozens of them. I established a policy to submit at least one query per week. I became a pro at “Don’t get your hopes up.” In fact, I made an art of killing hope at every opportunity. When an unread e-mail with the subject “Re: Query” would pop up in my inbox, I would automatically assume it was a rejection. Usually I was right. Occasionally, I was pleasantly surprised with a request to see more material. When I found myself fantasizing about The Call, I immediately shot it down by imagining how awful the rejection of that full request would be. I wanted to be prepared for the let-down, so I practiced it. This system—preventing disappointment by preemptively shutting down hope—seemed to be working well for a while. And yes, maybe it entices us to climb higher, and maybe the fall from that place hurts more. But that place it takes us is not just a place we fall from. It’s a place where we see farther, where we breathe better, where we reach higher. And I had been denying myself that view. I eventually realized that I was only hurting myself. About six months ago, I got another request to review my full manuscript. And I decided that this time, I was not going to shoot down my hopes and fantasies. I was going to let myself feel everything. The wait for the response was five nerve-wracking weeks. (I was lucky. This can take months.) And when that rejection finally came, it wasn’t just a rejection–it was a devastating rejection. Not a “love this but can’t sell it” or “enjoyed this but didn’t connect as much as I would have liked” rejection like some of the others. It was a “not good enough” rejection. I hadn’t shed a single tear over any of the rejections up until that point. But that night, I finally cried. I cried so hard I felt sick. It felt like I was emptying myself of all the overwhelming pain I’d been suppressing over the year I had been sending queries. It was wrenching and raw and agonizing. It was truly awful. I am a big fan of researcher-storyteller Brené Brown. In her latest book, “Rising Strong,” she writes about how we tend to gloss over this part of the story. “Gold-plating grit,” she calls it. We are always talking about rising from adversity and about how you have to keep on trying to succeed. We very rarely talk about what it feels like to be down in the trenches and how to effectively nurse our wounds while we are there. Brené Brown says that in those “facedown” moments, we should take a minute to look around and see what the world looks like from there. I hadn’t read her book yet then, but that’s kind of what I did. I carefully observed what happened to me in the 24 hours after receiving that rejection. I finally fell asleep at three in the morning, exhausted and drained, and when I awoke, the grief had not left. So I reached out for support. There are a few people in your life who run into the ring with a towel and a bottle of water when you are recovering from a knockout blow. Those are the people I spoke to. But they didn’t really understand my pain, because they had never been there, and I didn’t feel much relief. Then I did something kind of bizarre. I wrote a letter to myself from my favorite character in the novel. Strange as it sounds, that was what helped me start to feel better. By that evening, I was already surfing around looking for more agents to query and chattering to my husband about new ideas. In a way, writing that letter was calling up an inner voice that I was having trouble accessing through other means at that moment. And when I thought about it, I realized what that voice was. It was the voice of hope. That same hope that I thought did nothing but harm was what pulled me out of despair and helped me pull myself together and keep going. I won’t say that from that day forth I gave hope a free rein. For a while I stopped sending submissions because I wanted to protect myself from that kind of heartbreak. But I kept writing, and eventually found myself submitting again. The truth is that when you are a creative person who wants to share your work with the world, rejection is going to be an inherent part of your life. This is true even when you land the book deal of your dreams or sell a painting for seven figures. As long as you keep creating, and keep trying to put your creations out there, you are inevitably going to face rejection, whether it is in the form of a curt form letter or an unfavorable review or even just a person shrugging dismissively at your work. And it’s going to hurt. Every time. And suppressing or distracting yourself from that pain is not going to make it go away. In light of this, I decided that instead of avoiding the pain and disappointment of rejection, I would compensate myself for it. I would honor the courage it takes to keep trying even when I know that failure is a likely result. So I started a new ritual. I keep a bag of mini chocolate bars in my closet, and whenever I get a rejection, I treat myself to one. Because getting a rejection means I was brave. It means I took the risk–and then took the fall. It means I’m not giving up even after spending practically half my life shooting for the moon and missing. I reward myself for my courage. I deserve to hope. That means letting myself fully feel the pain of failure. And it hurts. It really does. But at least now I give myself a little something—trivial as it may be—to look forward to at the same time. And it tosses a pebble of joy into my emotional pond, sending out ripples to cancel out some of the waves of disappointment. I know I will never stop writing. There’s no question of that. As the piles of notebooks dating all the way from my days in kindergarten testify, writing is like breathing for me. I may never get an agent. I may give up on querying once and for all. I may turn to independent publishing and never look back. Or I may try again with my next novel and see what happens. But if there is one thing I learned, it’s that I need hope in my life, and I need to nurture and embrace it, not suppress or distract myself from it. I am still learning how to do that. Daniella Levy is a writer, poet, translator and self-defense instructor living in Israel. 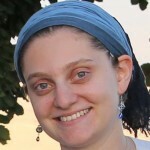 She blogs at LetterstoJosep.com about religion and life in Israel, and will be publishing a book based on the blog in 2016. Follow her on Twitter and on Facebook. Have an essay on writing life you’d like to share as a guest blogger? Contact me here. This is very well expressed and written. We all experience rejection, and it doesn’t really make us tougher. Even the smallest rejection hurts, even if it’s for a short time. What makes a difference is that we can choose how we deal with rejection, as Daniella Levy so eloquently expressed. We can choose to use rejection as a time for self-care, healing, and rejuvenation (sorry, that sounds like a prescription for a visit to the spa!) I have poems I’ve sent 20 or 30 times before they were accepted. And poems I sent once. So you never know. The important thing is to keep writing. Thanks so much for commenting Erica. I really feel this is an important conversation and that writers need to support each other–rejections are a common thread for all writers. Hmmm, a spa for writers… I love that! This speaks too forcefully to me… I get my hopes up too much when I submit to places, and I’ve come to learn not necessarily to discourage myself, but just to reach “neutral ground”. It hurts less. Thanks for reading and commenting Tiegan!